Rocky's is at 7360 Skidaway Rd. CALLING ITSELF the first of its kind, Savannah has its very own legitimate New York deli, Rocky’s New York Deli & Italian Catering. By “legitimate,” I refer to specific things— in-house curing of meats, Nonna’s recipes, and a chef and owner that are actually from New York. 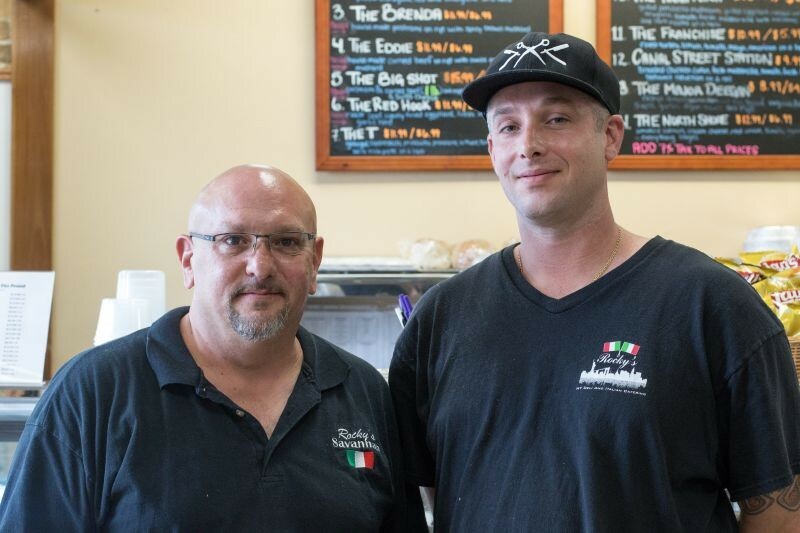 The owner of the brand new deli located in Sandfly, Bill Vissicchio, decided to follow his dream and give our city, which he loves almost as much as his hometown, a deli modeled after the kind he grew up visiting. The aim of Rocky’s is to make all of their food as authentic as possible. But the process does not end there! A rub is added to finish the corned beef before it is baked. As for the pastrami, a pepper base rub is applied and it is then smoked for at least 12 hours. Each cut is finished by slicing it, then served warm after a final steam. A full half-pound comes on every bread-encased creation, and if a half pound is way too much, the sandwiches are also offered in half sizes. 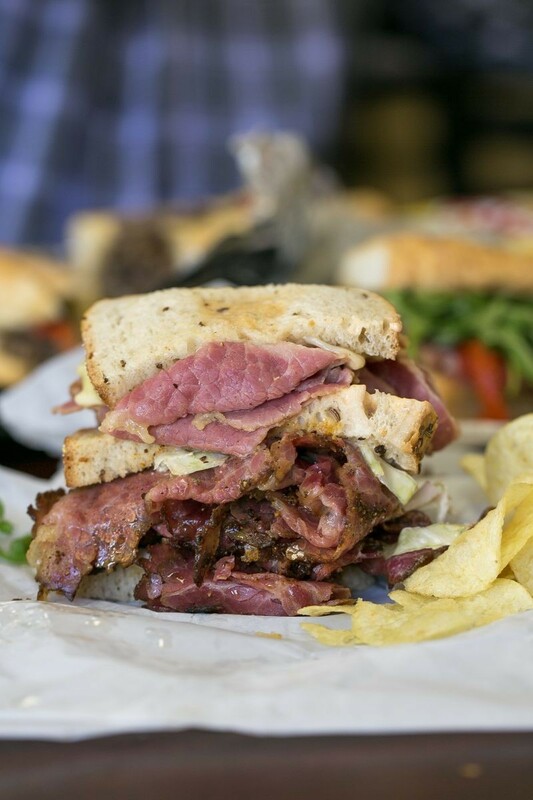 The Big Shot, a double decker sandwich, comes jammed with a full serving of pastrami and corned beef, meaning you get an entire pound of meat with your order. Three sour, earthy slices of rye bread house both meats along with swiss cheese, creamy coleslaw, and a vinegary Thousand Island dressing. 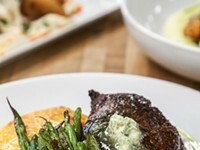 Everything combined creates a mouthwatering balance of flavors and textures. I would recommend the half size, considering you still get a full half-pound of meat, but be warned that whichever size you pick, you will not look delicate eating this gargantuan stacked sandwich. The flavor of both cured beefs is nuanced, almost delicate, much different than so many store bought, over-cured, and overpowering versions. I am extremely glad I stepped out of my Southern comfort zone and tried this monster, because it converted me to a pastrami and corned beef believer. I may even have a shirt made with that logo on it. I was immediately enticed by the Vito Spatafore, probably because the Southern in me is always drawn to fried chicken. As you could guess, the sandwich is named after a Sopranos character and capo to Leadbelly himself, and the guy who played him, Joseph Gannascoli, created the recipe just for Rocky’s. A flaky hero roll is sliced and packed with a golden brown chicken cutlet, arugula, Italian soppressata, roasted red peppers, provolone, and a dash of red wine vinaigrette. All together, the sandwich is incredibly balanced and not the least bit weighty. As for the sauce, it is made from scratch with San Marzano tomatoes and old school techniques learned from “the culinary school of grandma,” both Vissicchio and Chef Cammann explained. You can get the made-with-love meatballs on Fridays as their daily special. The daily special sandwich on the day I visited, Thursday, was a foot-long cheesesteak, and most of the patrons there were seeking it out. This sandwich is not for the faint of heart, and although the helping is hearty, it easy to scarf down due to the overall tenderness of the hoagie. Paper thin slices of shaved ribeye roast are cooked together with peppers, onions, and mushrooms, then smothered in cheese that lends a decadent mouth feel to the entire dish. The bread and beef almost disintegrate in your mouth as you eat each bite. 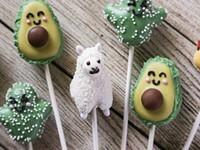 The creation of Rocky’s baked goods are a family affair due to the help of Vissicchio’s mother and sister; even shift leader Rachel Tinsley helps with the baking. All of the confections are made in-house, and feature grab bag of the classic New York bakery favorites. As it should be, a cannoli sits on the menu. A light airy shell, fried to perfection, is filled with a cream then dunked in chocolate chips. Owner Bill Vissicchio and Chef Nick Camman. Tri-Color Rainbow Cookies, the rainbow being the colors of the Italian flag, “are extremely labor intensive and took a lot of trial and error to get right,” Vissicchio explained. A thin layer of chocolate encases the delicate, almost cake-like layers of cookie. The overall flavor is buttery and nutty due to the addition of almond. Each massive cookie comes coated in two types of chocolate hiding a delicate vanilla flavored base underneath. Lets not forget the crunchy yet tender biscotti, which is Rocky’s final dessert offering. If you have not taken the time to stop by, you now have no excuse considering that in the next couple of weeks, Rocky’s will host a grand opening. At the party Bill Vissicchio and Chef Nick Cammann will offer samplings of their catering menu and host a cannoli eating contest.